in the climatic finale of Takashi Miike's spaghetti western tribute Sukiyaki Western Django. Miike delivers another wonderfully entertaining if somewhat bizarre western hybrid that mixes iconic American "Old West" gunfights with themes of Japanese feudal rivarly and even elements of the English "War of the Roses" civil wars into it's quirky story. If one can overcome the sometimes ambitious all-English dialogue, this may stand as Miike's most inventive movie to date. When one thinks of the cowboy Western, names like John Ford, Sam Peckinpah, Howard Hawks and John Huston might come to mind. Japanese new wave and cult director Miike Takashi would probably be the last person you would think of being on that list. That is, until now. With his recent Sukiyaki Western Django Miike pays loving tribute to the Western genre and infuses it with his own unique spin and a decidedly Japanese flair. Set in what appears to be a dusty post-apocalyptic wasteland, the story deals with a bitter rivalry between two vicious clans - the brutal Heike (whose color emblem is a bloody scarlet red) and the flashy Genji (whose banners are a snow colored white). They have taken over a remote mountain village in a region oddly called "Nevada" (spelled using Japanese Kanji equivalents). Both factions have learned of a mythic gold depository in the surrounding area and have torn the village apart to find it, but to no avail. The local inhabitants have long since fled and those that have stayed behind have been living in terror ever since. The local sheriff (Kagawa Teruyuki) is a cowardly opportunist who has been siding with whichever gang is currently winning the conflict. A mysterious gunfighter with no name (Ito Hideaki) rides into town and offers his services to the clan who offers to pay him the most. While both clans make tempting bids, the gunfighter rejects both offers and is instead swayed to hold off joining either faction by the town's salon madam, Ruriko (Momoi Kaori). Ruriko tells the stranger of how the town was taken over by the clans and how her son Akira was killed by them. Akira was a former Heike clan member who had fallen in love with the beautiful Shizuka (Kimura Yoshino), a member of the rival clan. They had hoped that their union would help encourage peace between the two clans but instead Akira is murdered by the Heike's ruthless leader Kiyomori (Sato Koichi). Devasted, Shizuka returns to her clan with her young child Heihachi, where she is forced to become a harlot to the clan's charismatic and mercurial leader Yoshitsune. As the conflict comes to an impasse both sides scheme how to gain the upper hand. Kiyomori tells his clansmen that it is divine destiny that they will win the conflict and sites Shakespeare's Henry VI and the English conflict of the "War of the Roses" (where the red side wins) as his bible. He is so sure of this that he adopts the name "Henry". On the Genji side, Yoshitsune has found the location of a hidden cache of weapons including a functioning Gatling gun which he hopes will give his clan the advantage. He sends his chief henchman, Benkei (Ishibashi Takaaki) to retrieve the weapon. The gunfighter learns of this plan from Shizuka and relays the information to the Heike clan who send their own men to retrieve the weapon. But Shizuka's betrayal does not go unpunished, and the gunfighter is severely injured. Nursed back to health the gunfighter teams up with Ruriko, who reveals herself to be the legendary gun fighter "B.B. ", who was a protégé of one of the first western gunmen in Japan, "Bingo" (Quentin Tarantino in a cameo). The two ultimately work together to destroy the clan and bring peace to the town. 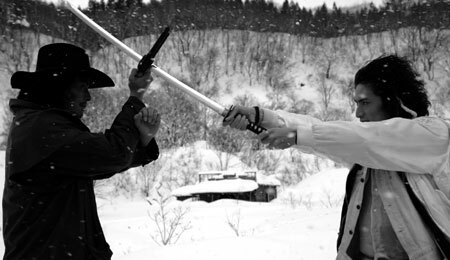 Miike and screenwriter NAKA(Masa)MURA borrow liberally from other westerns particularly the landmark "Italiano-Westerns" of Sergio Leone (A Fistful of Dollars, The Good, The Bad & The Ugly, and Once Upon A Time In The West) and Sergio Corbucci (Django) as well as the so-called "Acid-Westerns" of Alejandro Jodorowsky (El Topo). But Miike adds his own unique aspects and New Wave flourishes to create a Japanese version of the classic western, albeit with a decidedly Japanese look and feel. The name of the film is both a play on "spaghetti" (Italian) westerns and an anecdote where "sukiyaki" (Japanese nabemono or "stew") combines various elements in a pot. The idea shouldn't sound that far fetched as the Japanese have always had a fondness for westerns and such directors as Kurosawa Akira (Shichinin No Samurai a.k.a. The Seven Samurai ) and Buichi Saito (Guitar O Motta Wataridoria.k.a. The Rambling Guitarist) have claimed to be influenced by classic American westerns. Much has been said of Miike's decision to script the dialog entirely in English but I think the cast should be commended for actually pulling off what might have turned into a comical disaster. It also helped that Miike had the good fortune of hiring actors who have either lived or studied extensively abroad. Ito Hideaki (Crossfire, Limit of Love: Umizaru) plays the titular Clint Eastwood role as the gunfighter or "man with no name". His performance is good but one-note, as he doesn't really have much range and his lines are minimal. The physicality he brings to the role is quite good however and he definitely looks the part of a gun slinging hero. Sato Koichi (Cheerful Gang Turns The Earth, Tennen Kokekko) is pure evil as "Taira No Kiyomori", who fancies himself after Shakespeare's Henry VI. His performance brings to mind Mifune Toshiro's Kikuchiyo in Seven Samurai - manic, bestial, and cocksure of himself. Fashion model turned actor Iseya Yusuke (Casshern, Memories of Matsuko, Gaichu) turns in another fantastic performance as the vicious yet wickedly handsome "Minamoto No Yoshitsune", a man who fancies himself as the embodiment of the Japanese Samurai spirit, and whose sword skills border on the uncanny. Iseya is quickly making a name for himself as an actor who goes for quirky roles, and his intensity and presence reminds me a lot of the late Heath Ledger. London born Yoshino Kimura (Sakuran, The Backdancers) brings much passion, dignity and raw sexuality to her part as the tragic Shizuka. Momoi Kaori (Bounce No Ko Gal a.k.a. Bounce Ko Gals, Memoirs of a Geisha, Kagemusha), who was also educated in London, is clearly at home with the English dialogue and turns in a terrific and surprising performance as Ruriko, Akira's mother with the unexpected past. Ishibashi Takaaki (one half of 80s comedy duo "Tunnels") steals the spotlight as Yoshitsune's sexually ambiguous henchman as does Kagawa Teruyuki (HERO, Tokyo.Sora, RAMPO) as the bumbling sheriff who seems almost possessed at times. Oddly enough, it is English-speaking Quentin Tarantino in his cameo as legendary gunfighter Bingo that I had the hardest time understanding - especially with his odd character accent (Italian?). His appearance is very much fan service and while humorous and funny is a bit out-of-place in the movie as Tarantino is not really identified with Westerns (Eastwood would have been a more logical choice). Cinematographer Kurita Toyomichi's wonderful camerawork is interesting and makes fine use of the Yamagata Prefecture. Kitamura Michiko's audacious costume designs are also a great merging of cowboy iconography (chaps, vests, cowboy hats) with traditional Japanese ornamentation (tattoos, armor, emblems), creating a unique and twisted punk look.